Elegant wedding or party favors so beautiful they can double as table decorations! 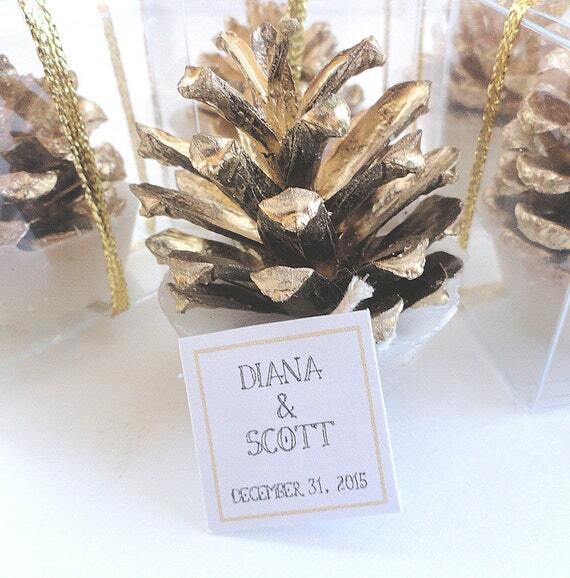 Each pine cone fire starter set includes coordinating gold ribbon, clear favor boxes, and personalized gift tags. Wedding Favor Tags: The bride and groom's first names, along with the wedding date are printed on each favor tag, or send us the wedding logo and we'll print it on the tags for you. Place them in a contained area, such as a fire place or outdoor fire pit and light the wick. Burn time is approximately 15 minutes. All orders ship via USPS Priority or FedEx with tracking # provided. Visit our store for more nature inspired party favors and gifts.